January 18, 2016 was not just your ordinary day in Phoenix, Arizona. It is a day that will always be remembered as the day that Dafne Gutierrez, a young blind Hispanic woman and mother of four children got her vision restored to normal through the intercession of St. Sharbel. Faith and confession is what Dafne Gutierrez continues to repeat time and time again when asked about her healing. "I was desperate when I walked into St. Joseph Maronite Catholic Church." Dafne continues, "I felt like God never heard me before, but this time was different, just different." Mrs. Gutierrez is not a member of the Maronite Rite and never heard of St. Sharbel before but she came with faith and prayed in front of the Relics of St. Sharbel, went to Confession and was blessed with the Holy oil by Fr. Wissam Akiki, the Pastor of St. Joseph Maronite Church. Within four days, her vision was restored to normal with a completely normal eye examination. Mrs. Gutierrez was diagnosed with Idiopathic Intracranial Hypertension in 2013. Despite aggressive medical and surgical treatment, her vision progressively declined leaving her completely blind in both eyes. Surgical interventions including ventriculo-peritoneal shunts as well as lumbo-peritoneal shunts were performed in attempt to lower the intracranial pressure in the brain and thus decrease damage to the optic nerve. Unfortunately, it did not work. "After trying every medication, I had two surgeries to decrease the pressure in my brain that failed and now there is nothing else to do. They want to put me in a nursing home because they said I can't take care of myself or my children." Mrs. Gutierrez immediately notified Fr. Wissam, as she was convinced that her healing occurred through the intercession of St. Sharbel in his church. At that point, Fr. Wissam consulted a group of physicians to investigate this occurrence. An extensive review of Mrs. Gutierrez’s medical records took place as well as repeat examinations. According to Dr. Anne Borik, a board certified Internal Medicine physician, "This is something we just don't see. A long standing damaged optic nerve causing blindness does not just all of a sudden look normal in two days with complete restoration of vision." According to the medical committee "We have no medical explanation and therefore believe this to be a miraculous healing through the intercession of St. Sharbel." Fr. Wissam Akiki, Pastor of St. Joseph Maronite Catholic Church has not stopped hearing confessions and ministering to those in search of healing through the intercession of St. Sharbel. According to Fr. Wissam, "In the midst of hundreds of people, I remember saying to Dafne's children, "Your mom will be able to see you again. Just have faith!" It has been over one month since Dafne Gutierrez was healed through the intercession of St. Sharbel and her vision is still perfect! As a gesture of Thanksgiving to God, Divine Liturgy and Blessing with the Holy oil of St. Sharbel took place on February 18, 2016 with his Excellency Bishop Zaidan in Phoenix, Arizona. 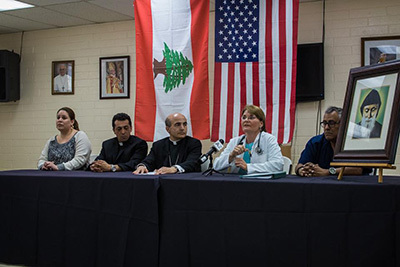 Bishop Zaidan said, "We look at the case of Mrs. Dafne Gutierrez and we thank God for the gift of healing she received at the occasion of the visit of the Relics of St. Sharbel, the Maronite Saint from Lebanon who spent 23 years of his life in a hermitage. During the visit of the Relics of St. Sharbel from January 15-17, 2016 at St. Joseph, she came and prayed asking St. Sharbel to cure her." He continues, "St. Sharbel is well known for his intercessory prayer on behalf of many people afflicted with various diseases. So many cases of healing have been attributed to the intercession of St. Sharbel. What is evident at this time is that Mrs. Gutierrez has regained her sight. We raise a prayer of thanksgiving to our Loving and Merciful God for His Providence and Graces. May this healing of the sight of Dafne be an inspiration for all of us to seek the spiritual sight, in order to recognize the will of God in our lives and to act accordingly. Let us all together follow the example of St. Sharbel in living our life as a pleasing offering to the Almighty God!" On the 18th of every month, Divine Liturgy and Blessing with Holy Oil of St. Sharbel will take place at 7pm at St. Joseph Maronite Catholic Church in Phoenix, Arizona. In addition, the first Tuesday of every month will be dedicated to Prayer and Reflection of the Chaplet of St. Sharbel and Holy Rosary at 7pm. All are welcome! All are welcome to worship with us. © 2019 St. Joseph Maronite Church. All Rights Reserved.